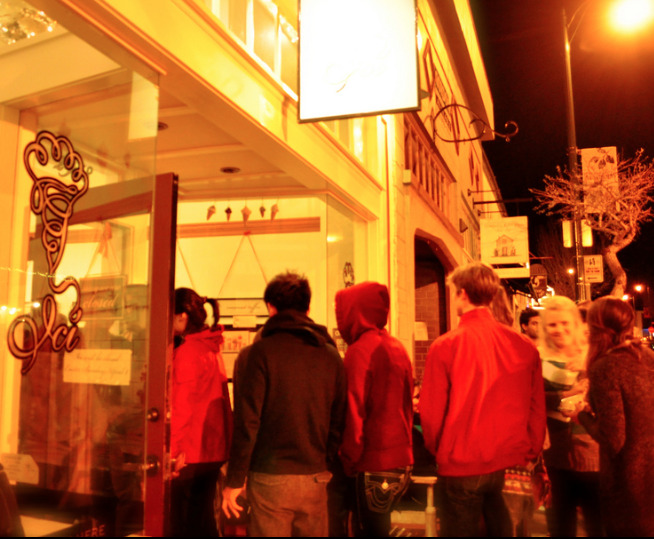 The Ici ice cream parlor attracts a crowd along College Avenue in Berkeley’s Elmwood neighborhood. Elmwood is one of Berkeley’s most desirable neighborhoods, with its mix of attractive, older homes, a vibrant restaurant and shopping district, and easy access to transportation. Elmwood is located south of the UC Berkeley campus, bounded by Telegraph Avenue on the west and Claremont Avenue on the east, as well as Dwight Way to the north and Woolsey Street to the south. At its center is the intersection of College and Ashby avenues, busy at nearly all hours of the day with patrons visiting gourmet restaurants, cafes, retail stores, and neighborhood shops. Restaurants long popular with the locals include Trattoria La Siciliana, King Yen, and Gordo Taqueria. The neighborhood is also home to the 33-year-old Nabolom Collective Bakery, Espresso Roma Cafe, Ici ice cream parlor, and Sweet Dreams candy and toy store for children. The landmark Rialto Cinemas Elmwood sits a few steps from the intersection, and the Julia Morgan Center for the Arts — once a church designed by the famed architect — is several blocks north. The Claremont branch of the Berkeley Public Library is nearby, as is the 2.7-acre Willard Park. Alta Bates Summit Medical Center is on Ashby Avenue, near Telegraph. Elmwood is home to Willard Middle School, which scored 811 out of a possible 1,000 recently on the statewide Academic Performance Index, or API. The private Maybeck High School is also in the neighborhood. “This was the area that … my friends (and I) wanted to live (in) when we were students at Cal,” NightOwlnOrinda wrote in Pacific Union’s Elmwood neighborhood reviews page. For all its relative calm, Elmwood enjoys easy access to the Berkeley and Rockridge BART stations, with Highway 24 and major through streets nearby. Most homes in Elmwood date to the early decades of the last century, and many were designed by leading architects of the day including Julia Morgan, John Hudson Thomas, and Bernard Maybeck. The neighborhood is particularly rich in spacious, Craftsman-style homes. Elmwood has many longtime residents, but the neighborhood continues to attract younger families as well. Because the area remains one of Berkeley’s most sought-after neighborhoods, buyers should expect fierce bidding for desirable homes.